This is the first time I’ve worn an all white outfit as I always try and avoid white bottom clothing. Honestly I wouldn’t wear an all white outfit again. I’ve worn this outfit in two different ways, tucked and untucked. Think I prefer the untucked look, looks less messy. I’m loving the panel mesh design and have been eyeing up many clothing incorporating this idea. This skort is from Sheinside and look exactly like the Zara skort. However the quality is different. It’s not up to the Zara quality but it’s cheaper. I do recommend it if you want to save on money. I own both the Zara and Sheinside skorts in white to compare the quality. Also my sister and I don’t need to fight over the skort now. I love the top, so cute! Looking amazing, love that outfit! It reminds me of a little snow fairy outfit! So pretty. I am THE worst with white clothing, make up stains everywhere T___T' look so gorgeous hun! This outfit is so cute! 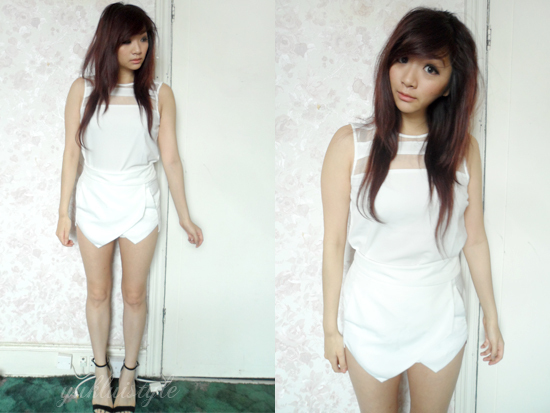 I love your shorts I definitely need to get more white clothes (: great post! You look so innocent and pretty in white. Matches your complexion. LOVE the all white everything! So chic!!!! i love white outfit ! The mesh panels on the white look so gorgeous on you! Love your hair too. Love this outfit, so simple but looks amazing! I relly like this look.